Carrot is one vegetable that I use everyday in my cooking. Mostly I use it to make salads or raita. Sometimes I do make soup or dry vegetable curry using carrots. Carrots are very rich in beta carotene and vitamin A. It’s very good for the vision, reduce cholesterol, protects the heart, anti cancerous , helps in cleansing the body and is very good for the skin too. 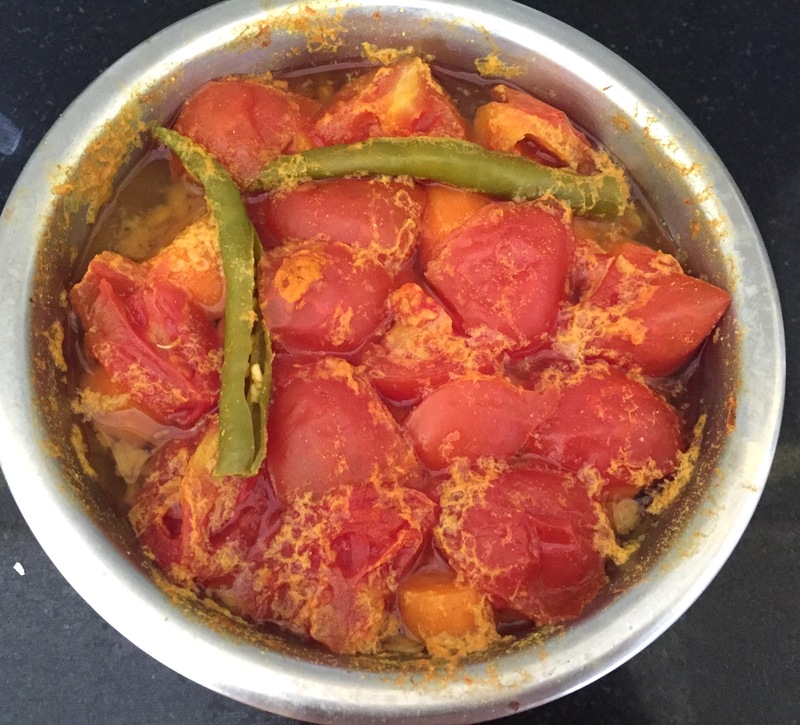 Roast all the ingredients mentioned for the rasam powder in 1/2 tsp of oil. Cool and grind to a powder. Soak tamarind in a cup of water for 30 mins. Squeeze well and take the extract. Wash and soak tuvar dal for 30 mins. Wash, peel and chop the carrots. 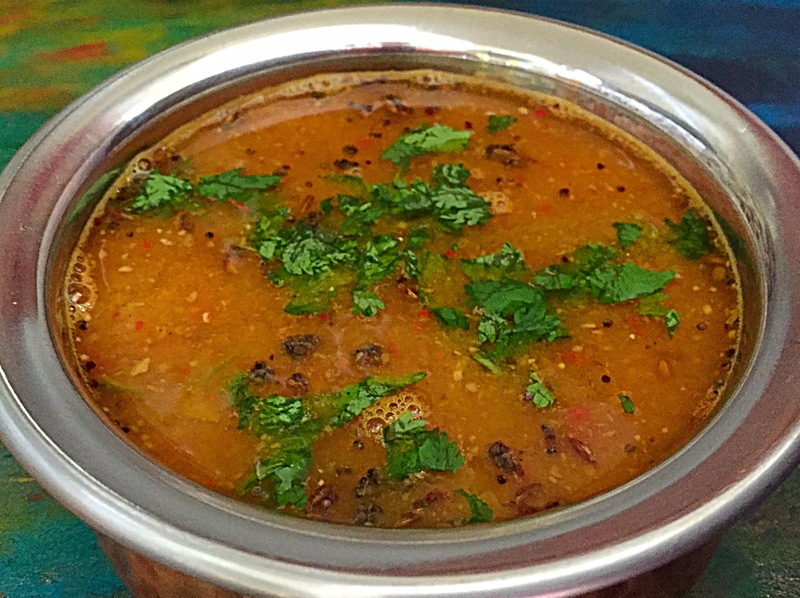 Drain the tuvar dal, add 1 cup of fresh water, chopped carrots, tomatoes, green chillies and 1/4th tsp of turmeric powder and pressure cook for 3-4 whistles. Grind the cooked mixture to a coarse paste. Add 1/4th tsp of turmeric powder, jaggery and salt to taste to the tamarind extras and boil it till the raw smell of tamarind goes away. Add the ground purée, mix well and let it cook for few mins. 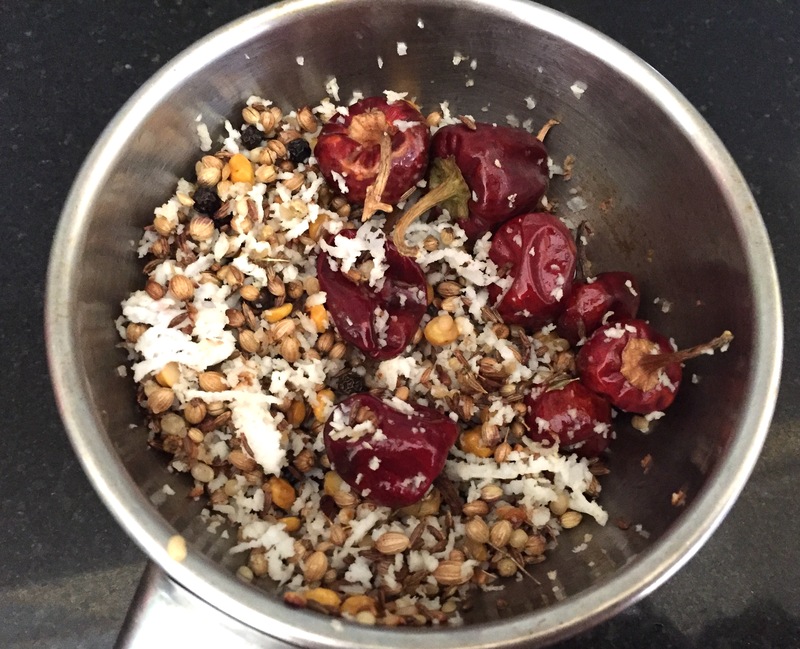 Add 1 cup of water to the rasam powder, mix well and add it to the tamarind mixture and mix again. Check the consistency. This rasam will be thicker than the usual rasam. If required add more water. Let the rasam simmer for few mins on a medium flame. Do not let it boil. Heat ghee in a pan. Add mustard. When it starts spluttering, add cumin seeds and hing. 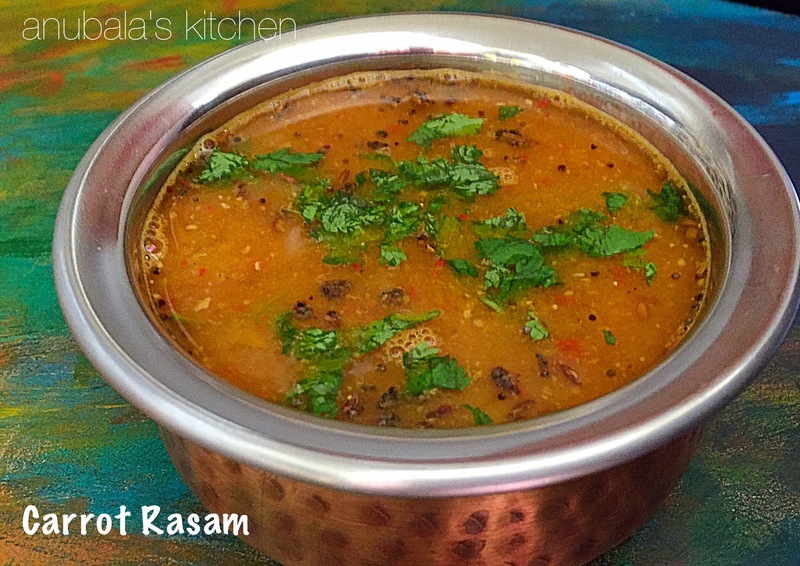 Sauté for few seconds and add the tempering to the rasam.